I wasn't planning to visit this pub today. But with a little spare time, I took a wonder away from Highbury & Islington station to see what it was like. The exterior doesn't look too promising. But the interior is typical of many in this area, with a limited number of cask ales, keg options and a fairly trendy crowd who congregate in fairly large groups around sofas and the like. A couple of groups were eating on my weekday lunchtime visit. The 4 cask ales were Truman's Fine and Dandy, St Austell Proper Job, Oakham JHB & Thornbridge Crackendale. There were also a number of keg beers from Thornbridge. Not too bad. My Fine and Dandy was slightly unusual, but absolutely fine. Not a bad boozer - decent beers and nice ambience. However the food was very underwhelming on our visit. Over a tenner for a burger that was way below the standard you expect these days. Fish and chips similarly poor. Advise to stick to the drink! I'm a massive fan of this pub. Great selection of beers, good food, open til late and always has a good atmosphere. It also has a massive outdoor area which is great in the summer; the downside to this is that it becomes a victim of its own success and so it can take ages to get served. Some say that this is because the bar staff are work-shy posers, and while this may have been a contributory factor in the past, the current batch provide an excellent service. 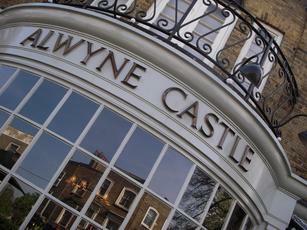 I have been to the Alwyne in the past and was sure it was a pretty safe bet, despite thinking the menu looked over priced thought it was pretty much the way of North London pubs these days. Four of us had the fixed price two courses for £10, on a mid week evening. Waitress was OK just a bit inexperienced. But it took 40mins for our mains to come and when they did. What a disappointment the 6oz steak was not what you would describe as steak, it was thin poor quality meat that was over cooked and in no way appealing grey, better described as a flipflop. The desserts that we had been looking forward to, we were warned were still frozen, would we still want them. Hmm we risked two and then had a cheesecake. Since when is everywhere selling pre-bought desserts that just aren't as nice as they sound. Disappointing. The bill was incorrect and we had to send it back. £4.50 for a half pint of hot cider is seriously cheeky. It was warming but not worth buying another. Maybe this pub is still OK for a summer pint in the garden but I won't be going for food again. All I can say is WASPS!!! Far too many bloody wasps! It has a fairly decent beer garden, although it does have the feeling of being a bit like a car park and it's right on a busy road, but as London beer gardens go it's not too bad. I've been there 3 times during the summertime, and the last 2 times it was ruined by the amount of wasps attacking us. The only reason for this can be the place is not clean enough. When we have been there we have noticed dirty plates and glasses left on tables for far too long. And because of this, both times we finished our drinks and moved on to the next pub.